Lesley Finlayson was born in Glasgow, Scotland. She received her BFA from the Glasgow School of Art. She moved to Canada in 1987 and continued her studies at the University of Calgary, where she graduated with a Master in Fine Arts. For 20 years, she was an educator in the Fine Arts Department at Langara College in British Columbia, Canada. 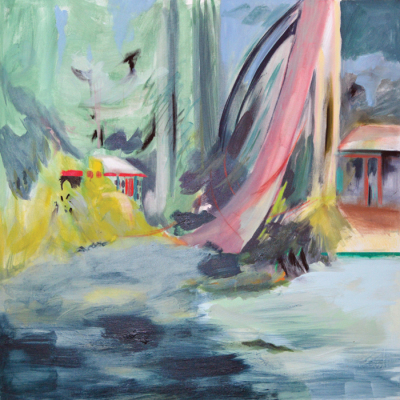 Lesley Finlayson exhibits in Canada and the United Kingdom. 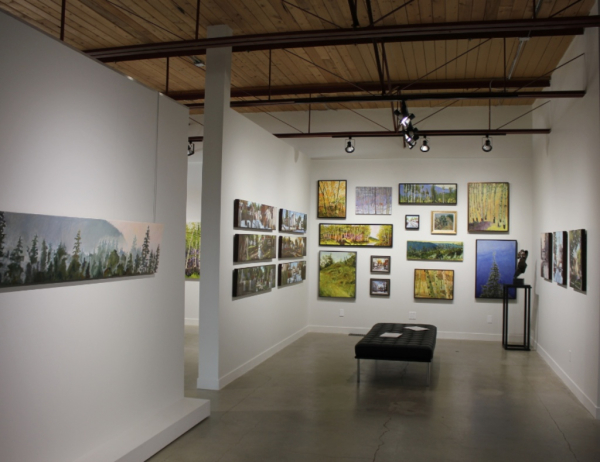 She has won numerous awards, including the Alberta Art Foundation Scholarship, the Elizabeth Greenshields Scholarship and the Hospitalfield School of Art Scholarship. Her work is in public collections: Esso Petroleum Canada, Sceptre Resources and private collections in Canada, the United States and the United Kingdom. Finlayson currently resides in Vancouver where she continues to paint. Kari Duke and Tom Gale beautifully portray the city of Edmonton. Kari paints the aging alleys in the neighborhoods around the University of Alberta. Their timeworn and commonplace qualities are what make them so inspiring to Kari. By portraying a subject matter that many of us overlook, Kari inspires us to take another look at the beauty that exists right outside our door. 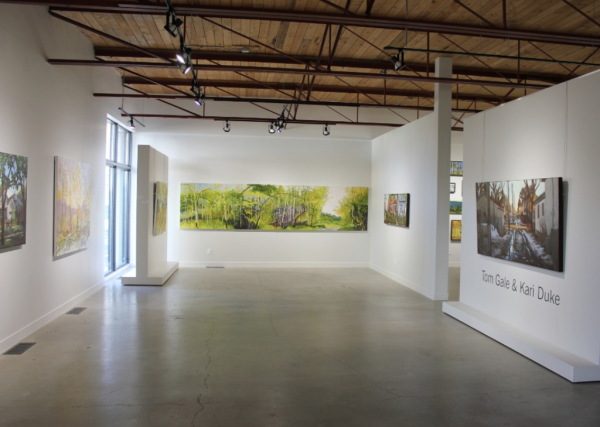 Tom's paintings are often of our river valley in Edmonton, although he does travel to Cherryville in southern British Columbia every summer to paint for a month. 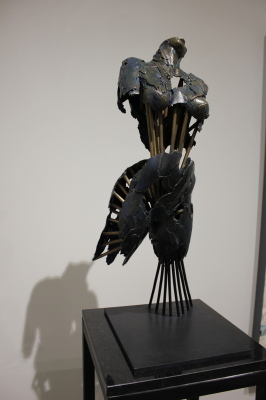 Tom notes, "A tension opposes two very different narrative themes within my work. On the one hand, the paintings express my own sense of spiritual oneness with the earth. Conversely, they express the isolation of my conscious being from the environment. I am interested in the dialect of seemingly opposing forces. Both artists can often be found at 'The Front Gallery', a refuge from the studio, and a great opportunity to network with fellow artists and customers. Anthony Charles Baker (born March, 1972) is a Canadian painter based in Edmonton, Alberta. He studied at the University of Alberta, majoring in painting, where he received a Bachelor of Fine Arts. By the end of art school, Tony was sick of painting. Like so many before him, he felt as though his work was lacking in that certain something that was exciting and fresh. This resulted in a hiatus from painting, and instead Tony was churning out playful drawings - musing until there was a collision between 'Nerd' and abstract-expressionism or as Tony would describe it 'abstract-escapism'. Maps, games, and hundreds of drawings later, a fantasy universe materialized...The Expanse. The Expanse is a universe filled with wonder since the surviving creatures have endured an apocalypse, and are finally finding the courage to push the boundaries by exploring planets that had once been teaming with life, but were abandoned or destroyed during the wars. The storyline is thoughtfully woven throughout Tony's work as he pushes into every kind of linear direction and the power of color modifies the depth of line and plane, creating the illusion of three dimensional form and space. With spontaneity and skill Tony fearlessly destroys, rediscovers and rebuilds areas that are lifeless, always mindful of the viewer, often understating the story to ensure that the work is open to interpretation. Tony Baker constructs a portal within each painting, and it is this invitation that makes his work so unique and exciting. Juxtaposing colors that convey lushness and intensity, with drawing that serves as the framework, the viewer can't resist the desire to explore their own creativity. This body of work is centered on themes of fragility, preservation and the effects of time. It reflects my interest in common dualities: structure/fluidity, control/disorder, stasis/change and protection/exposure. These drawings are a collection of overlapping moments - spaces and forms that show evidence of wear and attempts at fortification or insulation. They depict the inevitability of change, attempts to maintain equilibrium and the necessary process of revision and evolution. Matthew Petley-Jones is an accomplished professional artist whose paintings are characterized by the powerful vibration induced through broken-down forms and a distinctive interplay of colors on the canvas. His developed style can best be described as sensual and instinctive. his intense love of nature comes alive through expressive brush strokes captured within heavily applied coats of paint. Colors are bursting all over his canvas with the most natural energy. perfect match between message and form. 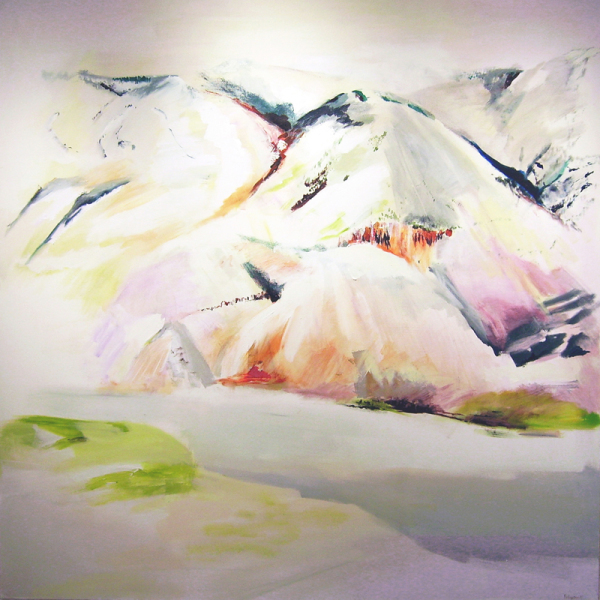 In his landscapes, the verge between land-water-sky dissolves almost completely, reminding us of a long walk from earth to heaven; and that is exaxtly what this artist performs when laboring on his large scale canvases-it is as if there, in his studio, he sets off in search of the metamorphic moment of transformation from flesh to spirit, trying to capture the life of the mind and heart together as a mix in every drop of paint used and with every methodological decision made. Exceedingly dynamic motions of his brush, swaying between land and sky, invite the viewer to move back and forth within the material and spiritual depths of the works. This is a quality inherent to all his paintings whether they are a reference to atmospheric conditions or to the movement of brush over the canvas, a philosophical questioning of states of existence, or an aesthetic rendering of color field imaging. The painterly faculties - vibrations of the ground yet sapient, synthetic understanding of nature - mark every Petley Jones brush impression. He achieves thick layers of paint leading to a varied density and intensity in the appearance of the surface. 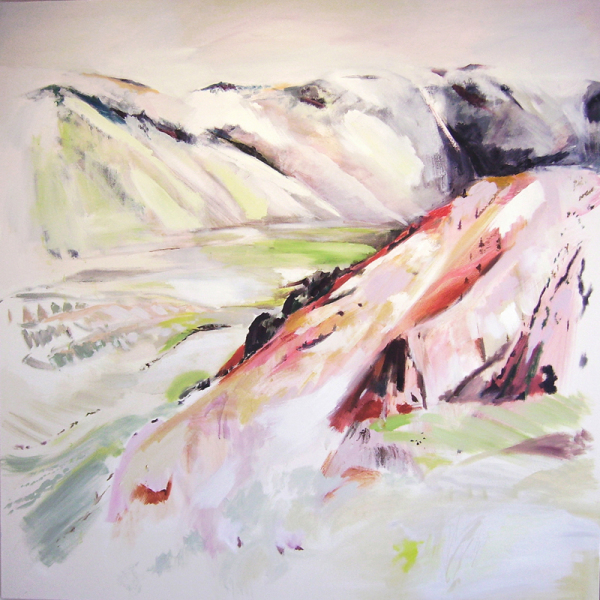 As we sink into a complete emersion in the power of nature and into a massive wall of rushing paint (in which the color itself seems to tremble and govern) we learn that it is with this independent life of form and complex pigmentation that artist Petley-Jones creates physical and spiritual life. The inspiration for this show is derived from my increasing affection for occupied spaces and how we are physically closed to each other, whether we are separated by walls or by fence, we are also connected, by cable, physical and wireless; cellphones and social media. These communication tendrils grow from the rooftops and towers, and linger on the horizon. In most cases, I’m using this wireless technology to search out the subjects for the work. Whether I’m shooting an apartment building with my iPhone, or using Google Earth to find a bird’s eye view of a neighbourhood (usually McCauley, Norwood or Holyrood). The painting process involves a lot of resin, little paint and a wood base. The paint plays a crucial role, in that it is the colour and texture to the image, but it’s the resin that brings it to life, allowing the pieces to change and alter as the light changes throughout the day. It even changes when viewed from different angles, giving it an illusion of subtle motion. Layering the paint between thick coats of resin basically suspends the image between two transparent blankets. What separates the colour is masked by frisket (a type of masking tape usually used for airbrushing vans), when pealed off, allows the wood grained base to show through and define the image. This is the last step, so I’m never totally sure how the piece looks until the tape comes off, making for a nerve-racking finale. "Bodies in metamorphosis, balanced between apocalypse and the Postmodern, steeped in a lost Classical age, echoed through an ever-evolving Renaissance, in vibrant tension or torsion as they head toward some future utopia. Undeniably endowed as sculptor and Neoclassicist, with his wandering, ambiguous forms. Blake questions the anthropological concepts of a heart-rending humanity, suspended between past and future. Blake's strongly dynamic bodies - at once powerful and fleeting, and gesturing violently, fixed in bronze in a state of dematerialization, somewhere between being and nothingness - appear to seek a dialogue with the absolute. They are inexplicably solid and light, conceived to last in time and space, destined to become a mythology of our digitalized, computerized present, and have a great emotional and visual impact. Blake places the human (especially female) body at the center of what he is seeking, with its expressive, metaphorical potential as a subject of investigation and contemplation of the human condition, using sculpture to give plastic form to our otherwise imperceptible inner realm, in a potent almost Michelangelesque physical presence. Calmly, these bodies ooze with anxiety, and seem to express a dialogue between skin and flesh, spirit and matter, in a coupling of physical and spiritual entities: a recognition of interior and exterior, to be seen and touched, seductive and irremediably tragic in the celebration of the power of the body. They are goddesses and heroes, myths about everything or nothing - bodies that symbolize the loss of the transcendent from it perfect imperfection." This year has been filled with anticipation for the renovations at our new space (that we are now occupying) turned out better than we could've envisioned. At the onset, it was disheartening to be taking on the project, but as it progressed it became apparent that we were settling into a really fantastic arrangement. 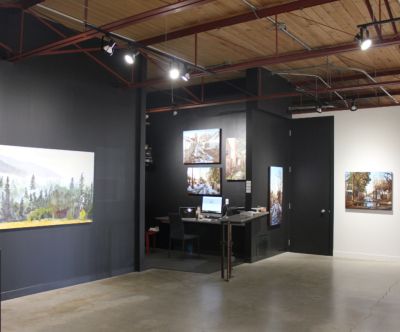 Sharing the new space with The Peter Robertson Gallery, The Front Gallery is now situated in the heart of the Gallery Walk district.